Cue the hallelujah chorus, my friends. 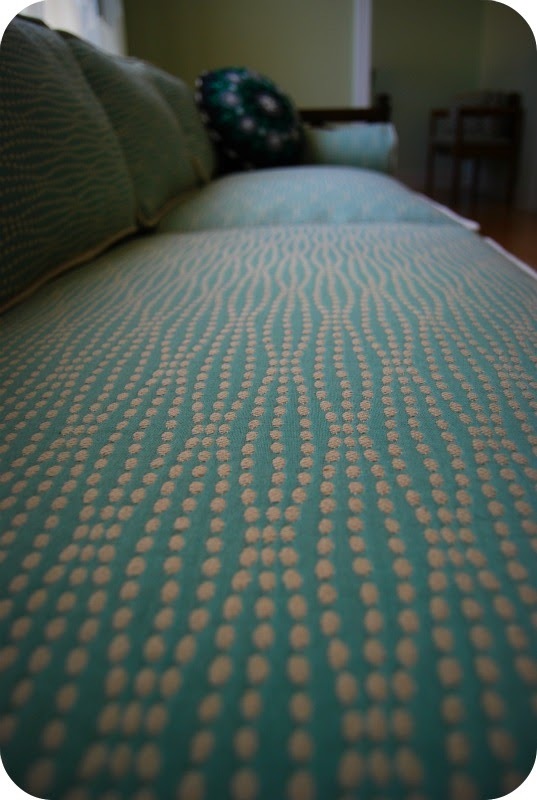 The sofa is done! It's hard to photograph a looooonnnnggg sofa.... I swear it looks more spectacular in real life. Or maybe that's just because I can lay on these fluffy down cushions and my feet don't touch the end. Eight exquisite feet, people. The stuff dreams are made of. This is the place to take a nap. Originally, J and I had picked out a large print. 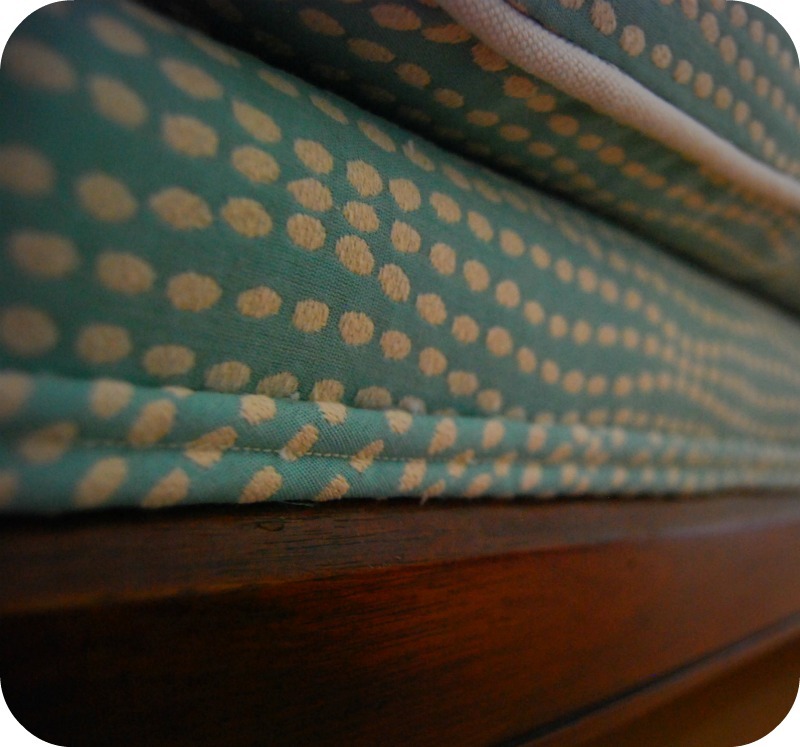 But we ended up going with this wavy dotted blue-green fabric. A much smaller print. And I'm glad. Not too many pattern matching issues came up. And the lines followed a geometric pattern, which made cutting easy. I decided on the natural canvas cording despite my misgivings about the previous white upholstery job. Fingers crossed that it will stay clean. And here's the back. Oh, the beautiful back! If we did anything perfectly, it was this. Stretched smoothly, stapled seamlessly, double welted impeccably... and no one will ever see it. I told J that we need to turn it around and have it face the window for a while. Then the back would be the first thing you see when you walk in the room. And here's some hot close-up double and single welt action for all you amateur upholsterers out there. Check out that nifty little pocket where the zipper pull stays hidden. 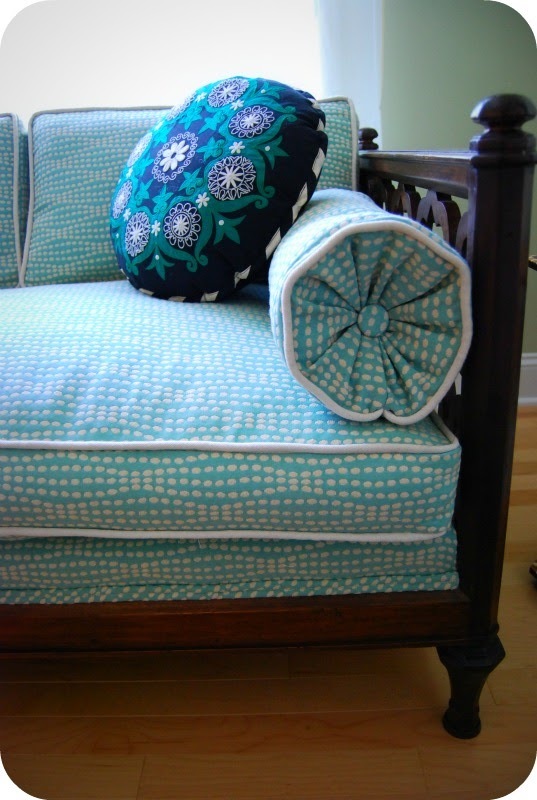 By far, the most time consuming part of this project was sewing the box cushions. Design*sponge just recently posted a fabulous boxed cushion tutorial if you are interested. I reckon I spent about two hours per cushion. 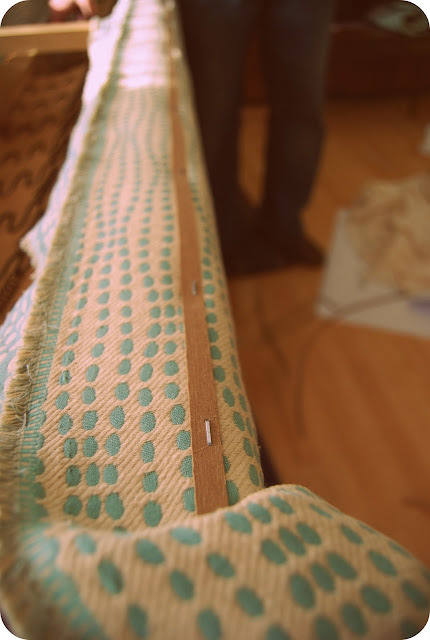 That included making the cording, which was incredibly time consuming as well. I made miles of it. Miles. The actual covering of the couch was pretty quick. I'm guesstimating it took us about eight hours all together. Including double welt. J spent quite a few hours patching and repairing the wood frame. He thinks about six hours. Granted all of this was spread out over, um..... ten months? Ok, really we did most of it the last month. May- Bought sofa from Salvation Army for $27. 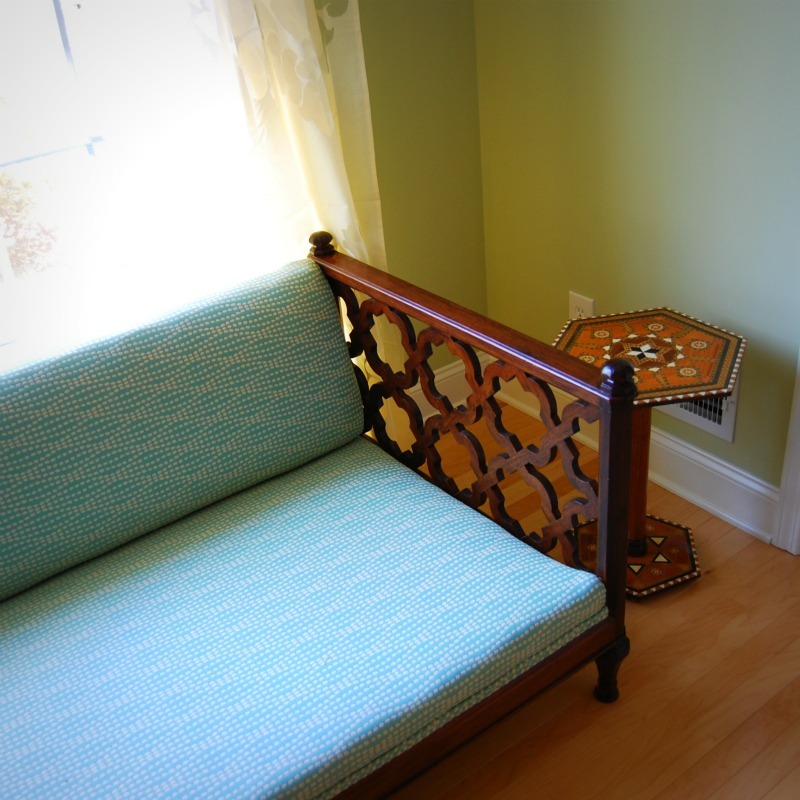 Husband and I decide to upholster it ourselves. Early June- Strip down sofa to burlap, springs and wood. Learn so much in the process. Take muchos photos. June through December- In paralytic shock over how much upholstery fabric costs. 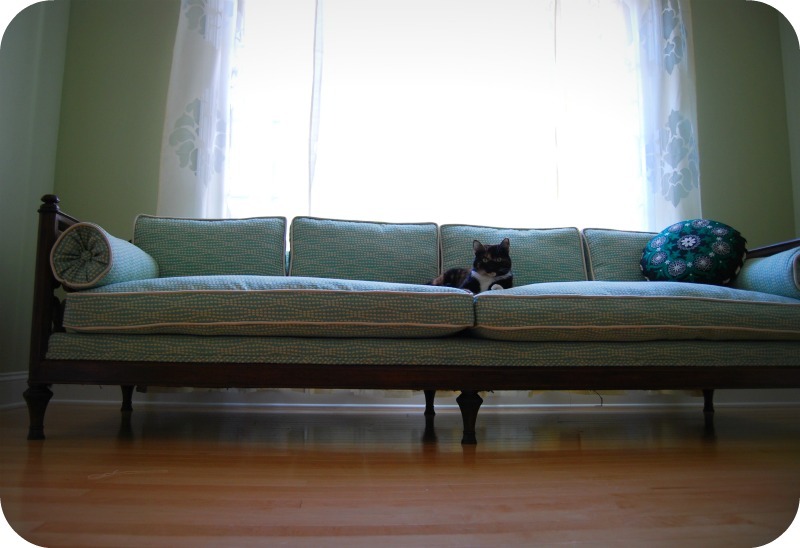 The $27 couch becomes much more costly. Sofa sits in smelly heap in living room for 7 months. New's Years Eve- Spend Christmas money on fabric. 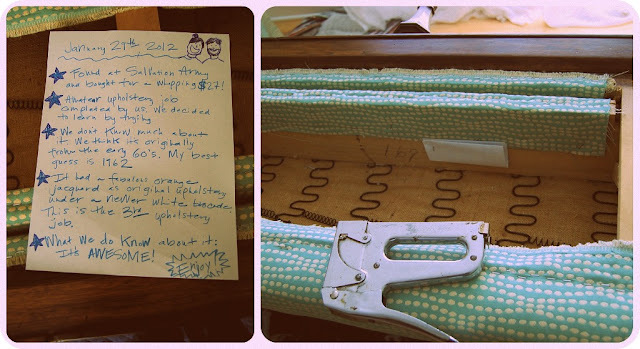 January- Upholster sofa through trial and error. Also, have many arguments over whose modus operandi is better. I fly by the seat of my pants. J, well, is a researcher. I think we needed a little of both. Yes, Dacron is your friend. 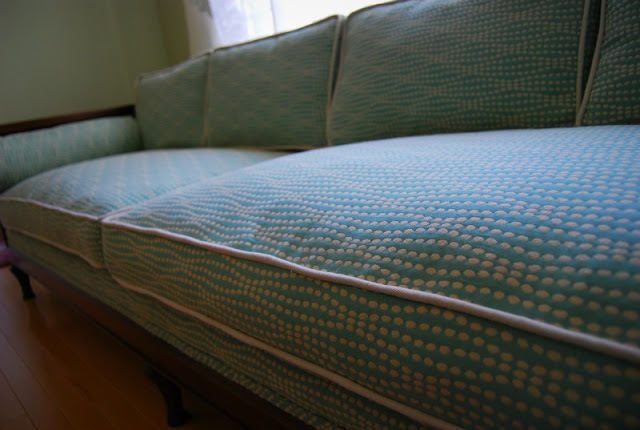 It smoothed out all the lumps and bumps and made the fabric stretching process so much easier. I was super pleased with the finish. We actually used more Dacron than the previous upholsterers (they actually used a batting) and I think our upholstery job is nicer. We'll see how it all holds up. Also, I think it helps to have two people to pull and staple. Especially on a piece this large. I swore I wasn't going to post any more kitty photos. 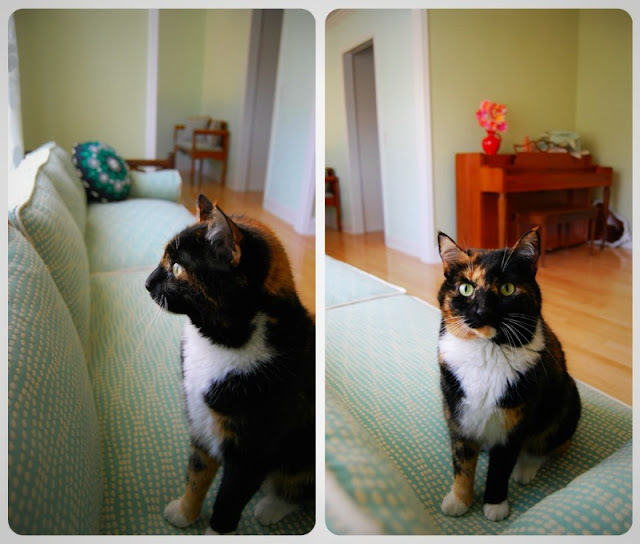 When I scrolled back through all my posts on the sofa, she's in every one. Every. Single. One. I'm sure there are people reading and rolling their eyes. But she's just so darn cute. And the couch is directly in front of the bird watching window. Your perch is ready, my dear. Here are links to all my posts. 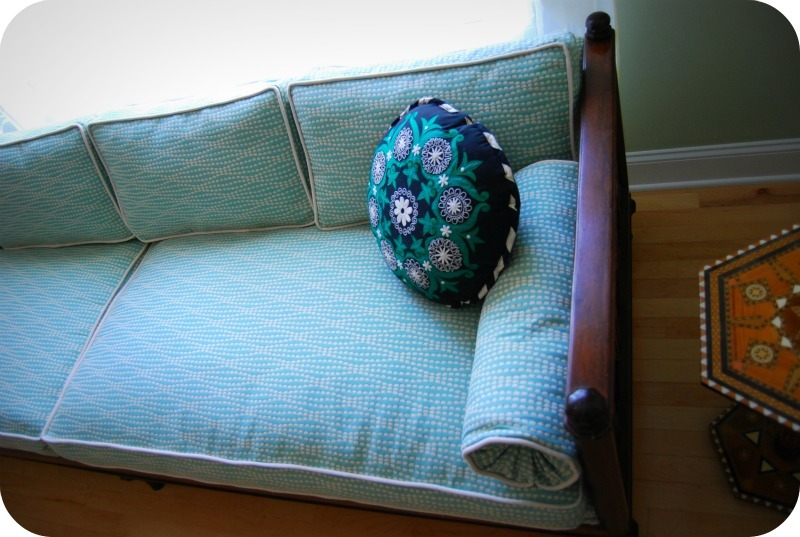 This Sofa Was Made For Reading from Liza Jane on Vimeo. I am not going to tell you how long it took me to make this video. It's too embarrassing. 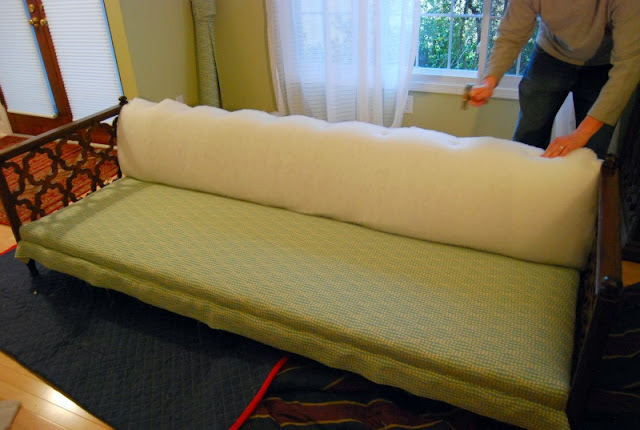 Maybe longer than it took to upholster the couch- ha! 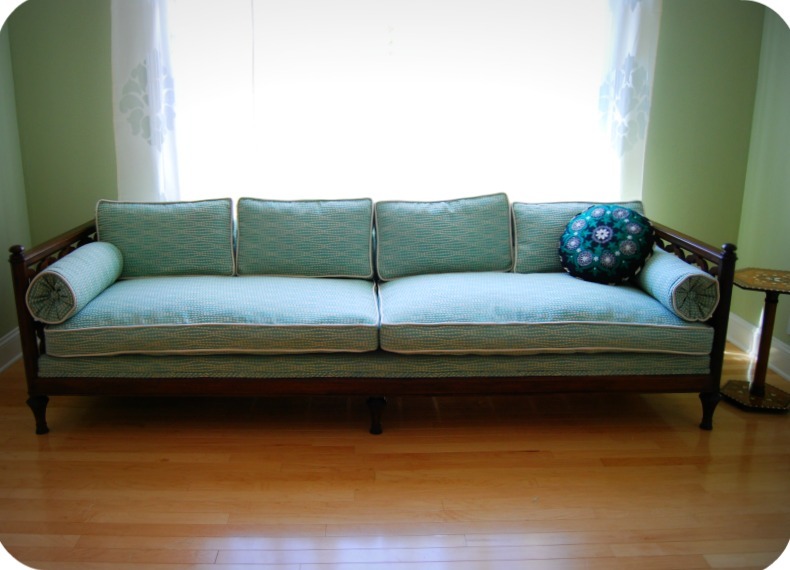 The sofa is done. Totally completed. Finito. J and I put on the last bit of double welt this weekend. I had planned on doing a final post today, culminating with this stop motion video. But being a total video amateur, it took me forever to figure out how to do this. Forever. I was even scratching my head on how to post it here. And adding music- oy, what a headache. Hence the dorky piano music. No chance of any copyright infringement here. On a side note, it's funny how music changes the mood of a video. I ended up with this particular song choice because it made the sofa seem happily enchanted. Before, I had some ominous tune that made the cushions seem utterly creepy and crawly. How did you do it, Alana? Your fun little video the other day inspired me to try it myself. I guess I could have just emailed you and asked. But being rather bullheaded, I just plowed on through with my techno-ignorance. Once I started I was determined to finish. Anyway, here is my cinematic masterpiece! Please ignore the little fuzzy monster who butts in every so often. I could not keep her away. So named because the fabric reminds me of a crossword puzzle. The pattern was a bit befuddling, too. And the end result is ambiguous, at best. What's a three letter word for shoddy, quick construction? Dubious fabric? Questionable silhouette? I like this blouse. There's just a few things to fix before I actually wear it out and about. And I'm not entirely sold on the silhouette from the side view. Is a large bow on your belly a good look? I dunno. I don't hate it. It's kind of fun and quirky. This is 12/2011 blouse with bow #119 from Burdastyle magazine. I was curious about their tall patterns, which is part of the reason I made this one up. I'm not exceptionally tall but I'm definitely on the taller side of average. I'm 5'9" (175 cm) and I find that I'm in between regular sizing and tall sizing in ready to wear. Normal rtw clothes are always a tiny bit too short and tall sizing is always a bit too long. So I was curious about the length in a Burda tall pattern. The verdict? The hem length is nice. I didn't notice any difference in sleeve length-- I took the tiniest baby hem there. But I do feel like the length from shoulder to bust is too long for me. Though it could have something to do with the deep v-neck. Super deep. I knew it was going to be low, but it actually hits below where my bra sits in the front. If you are wondering why the v-neck looks a little off in the photos of me wearing the blouse, it's because I hand basted it closed about four inches. There's a lumpy bit where the facing meets in the middle. I'm debating whether I should unpick the facing and raise the neckline or just wear it with a camisole underneath. The photos on the dress form are the unaltered neckline. 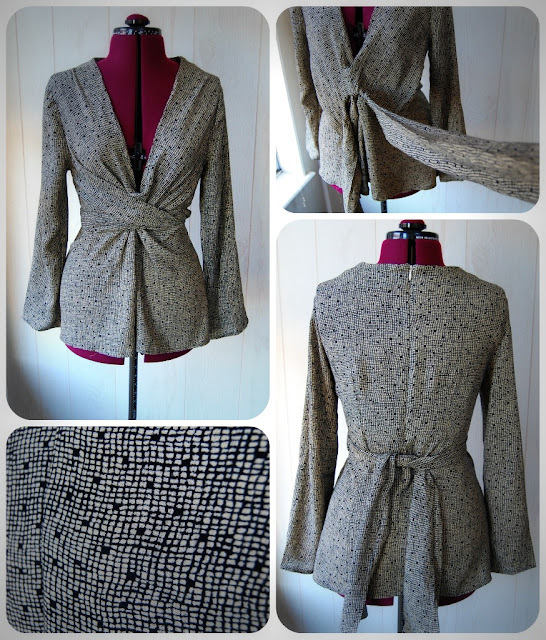 I ignored the suggestion of a stiffer blouse fabric and used a clingy, drape-y rayon in my stash. I actually thrifted this fabric. The bow would be more sculptural in a stiffer fabric. And that could be fun. But I'm working on cutting down the dreaded stash. The thinner fabric also caused all sorts of pull wrinkles from tying the bow in front. And my inverted pleat is pretty lame. Ah well. I was on a mission to finish a project (finally), so I let a few things slide. As far as the construction goes, I was pleasantly surprised with how it all came together. The front pattern piece looked totally foreign to me with the ties attached initially. But once I sewed the first seam, it was apparent how it all came together and I could bypass the notoriously sparse Burda instructions. One major difference in my version is that my bow does not wrap around and tie in the back. I could not find the tie extension piece on the pattern sheet for the life of me. I found what I thought was the right piece and traced it, but it didn't fit. So I left it off. This is the length of the bow without the extension piece. Below is a photo of how it looks wrapped around the front and tied in the back. There is a dress version of this blouse in the same issue and they show it tied like this. I like it this way, too. The only alteration I made to the pattern was to lower the back neckline about 3/4", which is a standard alteration for me now. I meant to do a square shoulder adjustment when I sewed the shoulder seams but forgot. Don't seem to need it in this drape-y fabric. 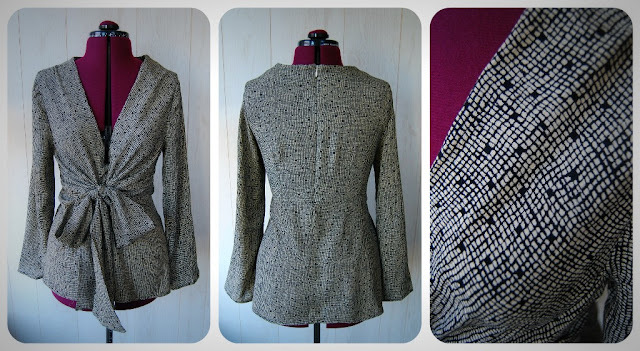 It's a nice and unusual blouse pattern. I enjoyed the construction. It's always fun to piece something together that is different from anything you've sewn before. Just a little tweaking of the neckline and it will be a properly wearable garment. Man, it feels good to finally finish something! I have so many projects in the works, but I can't seem to complete anything. What's that called, start-itis? Yeah, I have that. Time to get a move on and finish some things up. Someone motivate me, please. Hope everyone has a great rest of the week. Every so often, when I get totally swamped with work and other responsibilities, I catch myself making something super crafty and cheerful. Yeah, I know how ridiculous that sounds since my day job is an elementary school art teacher. But I mean besides all the normal artsy, cheerful kiddie projects I teach on a day to day basis. Um, yeah. 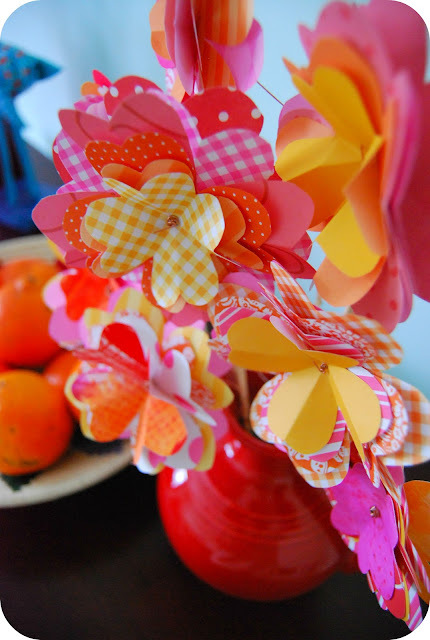 Anyway, I caught myself making tons of these heart flowers the other day when I had many other things I should have been doing. Excuses, excuses, right? I used the origami square base as my starting point. I use this square base for lots of things. It's a handy little fold. 1. Start with a square. 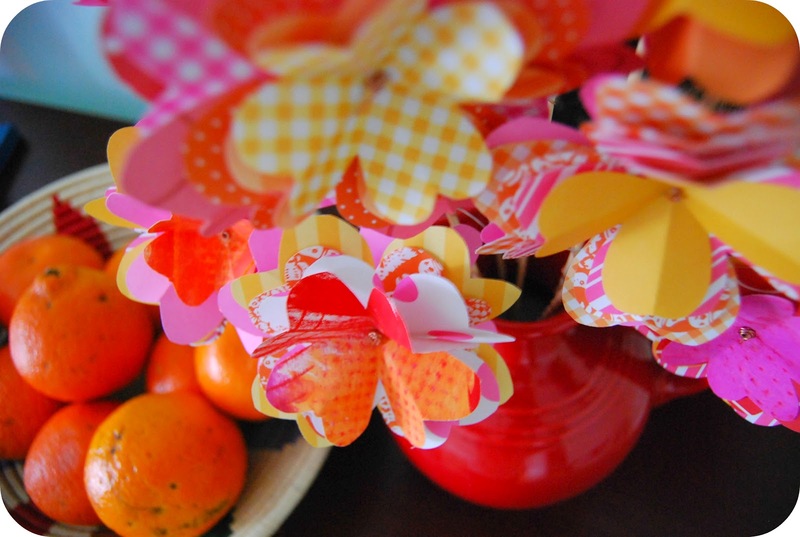 I used mostly scrapbooking paper, but I also had a little bit of painted paper leftover from another project. For illustrative purposes, it's nice to have one side of your paper patterned and one side white. My squares were 4" x 4". 2. 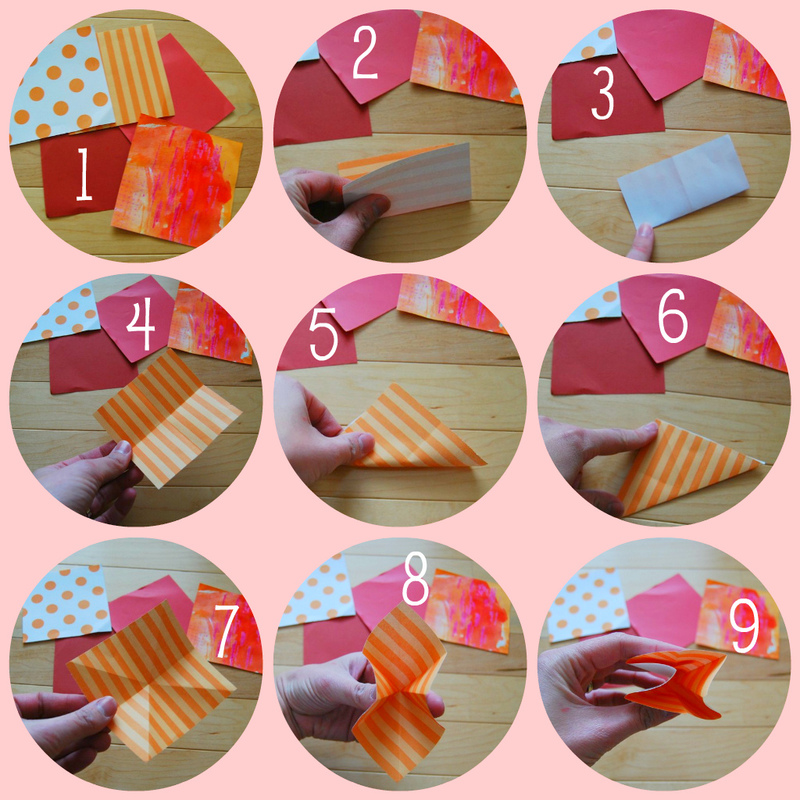 Fold in half, patterned side of paper together. 3. Fold in half again, other side, patterned side of paper together. 4. Open up. You will see a cross on your paper. 5. Fold in half diagonally, white side of paper together. 6. Fold in half diagonally again, white side together. 7. Open up paper and pop center of paper back. 8. Now this is the tricky bit. Fold in sides of paper. You can sort of see how the paper wants to fold. 9. 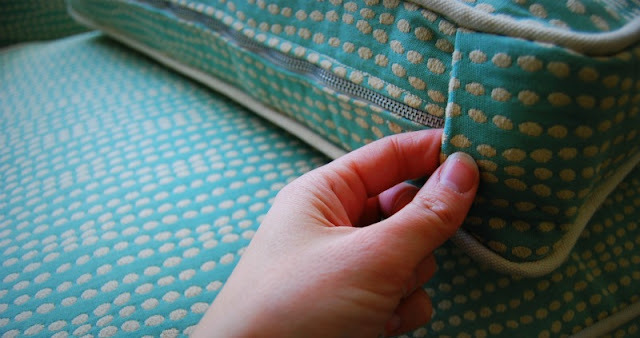 Push in the sides all the way until they meet and push the top and bottom down flat. This is an origami square base. 10. Now that you've made the square base, it's time to cut it in to a heart. Keep the folded point facing the bottom (this is the center of the original square). 11. Cut a heart, keeping the folded point intact. No worries if it's lopsided. Many of mine were. 12. Open it up and admire. It almost looks like a four leaf clover. 13. Repeat all of the previous steps and cut more. I cut each heart a tiny bit smaller than the last as I went along. I also used about five squares of paper for each flower. 14. String on to piece of wire. 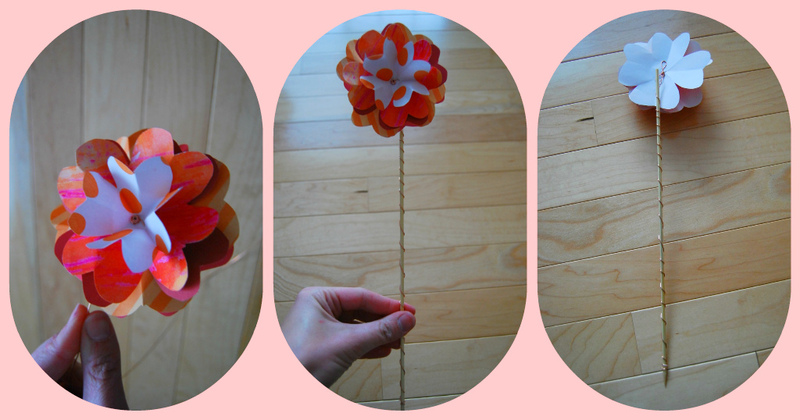 I twisted a little knot in my wire first to keep the flower in place. The I pushed the wire through each piece. I twisted the end tightly to keep all the heart petals together. Please ignore the kitty paw in the last photo. My wire wasn't strong enough to hold up my flowers, so I twisted it around a bamboo skewer to make my arrangement. 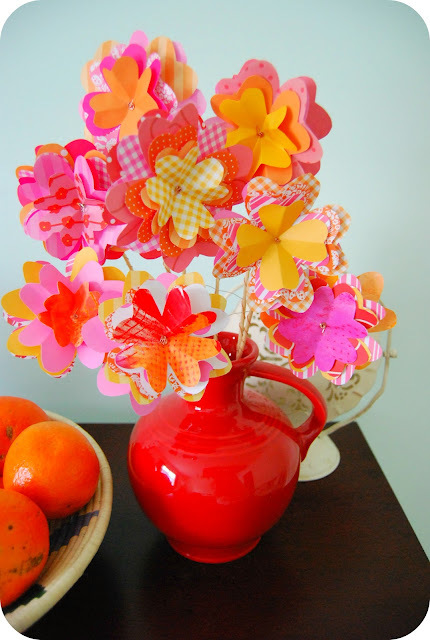 I also "fluffed" up my flowers by pinching the folds again. Make lots and put some place pretty to enjoy! 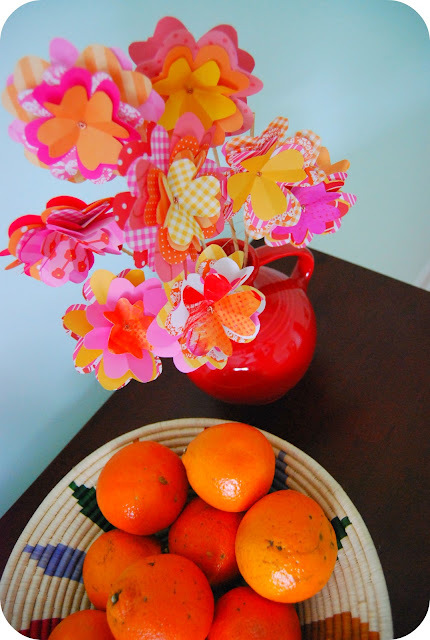 I couldn't resist putting my bowl of oranges in the pictures. It was just too perfect. The origami square base is a great starting point for all sorts of things. And you could cut any shape actually, not just hearts, but the timing is right for these. I love making things out of paper. It's so simple and satisfying at the same time. I said, "How come we don't write notes to each other? Upholsterers. We're the only ones who see the insides of this furniture. We should have so many inside jokes and things we could write." You know, "This guy was a jerk. He wouldn't pay for this." J read an article a while back about Jack White and his first band, The Upholsterers. He and his band mate were actually upholsterers. I found a similar interview on the NPR blog and another from The Believer. They are entertaining if you are interested. You can read about how he started writing poetry on furniture he upholstered and then later hid records inside. Can you imagine finding a record inside your furniture? Crazy. Anyway, J and I are both fans. Leave it to me to take a really cool and artistic suggestion from Jack White and turn it in to something totally geeky (see my note above). We decided not to leave our names in case whoever finds it comes after us for the amount of staples we used. Seriously. This sofa is stapled everywhere. I scribbled a quick note elementary school style and tucked it inside before we closed up the back. I wish we had found a little note like this when we stripped it down. I would have loved to know a little bit about the people who owned the sofa before us. Think anyone will find it down the road?